In this DIY guide, learn how to install a multifuel wood burning stove in a workshop or other outbuilding. Despite some opinions, installing a wood burning or multifuel stove is a DIY job and can be done by anyone. Lean how to locate your stove on a suitable surface, select the correct flue and correct location to run it and install it and also what Building Regulations Approved Documents you need to follow to stay safe. At DIY Doctor we do get quite a few questions surrounding multifuel and wood burning stoves, particularly installing them. Many of the questions we get asked include; Can I install a wood buring stove myself? Should I install a Multifuel stove as opposed to a wood burning stove? What regulations are there concerning installing multifuel stoves? What type of flue should I use? What are the differences between multifuel stoves and wood burners? The list goes on! In answer to these questions and more this project covers how to install a multifuel stove in a workshop and includes what type of stove you should go for, what flue to use, where to run your flue and what safety and Building Regulations rules you will need to adhere to. If you are looking to install a wood burning stove in your home, check out our wood burning stove project here. What Type of Stove Should I Have? The choice between these two is really up to you and the one you opt for will largely depend on what you intend to burn in it. If your installing your burner in your carpentry shop then the chances are that you are going to have plenty of timber offcuts to burn, so in this instance, a wood burning stove would be the way to go. If however your stoves going into a mechanics workshop, fuel will need to be purchased so it would probably be best to go for a multifuel stove as this will give you plenty of options in terms of the fuels that you could burn. Additionally, the overall output of both stove-types is pretty much the same so regardless of the type you go for, they will both pump out a similar amount of heat. Should you run the Flue Internally or Externally? If you are new to the world of wood burning or multifuel stoves then you may not be too familiar with what a flue is. Essentially, the flue is the chimney section that gets rid of any smoke or fumes generated through the burning of the fuel to the outside, preventing it from smoking the building itself out. Externally: Flue pipe runs from the stove to the nearest external wall and then vertically upwards to the desired height above roof level. So, with all of the above in mind it’s easy to see that running your flue internally is the best option; it’s cheaper, stays warmer, is easier to clean and is much safer as it reduces the chance of any fires. Depending on the age and type of roof that the building has that you are looking to install your stove in, it may be that you have the old style corrugated cement fibre roofing sheets. If this is the case then there is a strong chance that these sheets will have been made using asbestos fibres. Under no circumstances should you attempt to cut, break or form any type of hole!. By doing so you will disturb it and release asbestos fibres into the air. Asbestos is highly dangerous and has been linked to numerous health problems, many of them fatal, so leave it well alone. In situations like this it is best to go through the wall and stay well away from the roof. If you are unsure about what type of roof you have, check out our project on asbestos here. Within the project you will also find information about a DIY Asbestos Test Kit that you can use to identify what type of roof you have. Should you use a Single Skin Flue or Insulated Double Skin Flue? 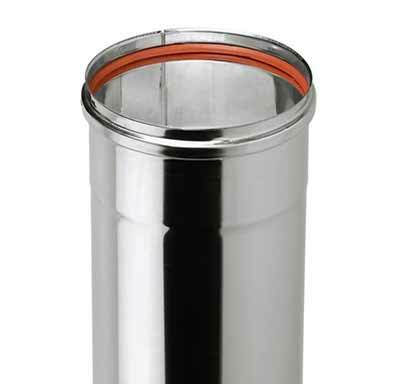 What is Single Skin Flue Pipe? Single skin flue pipe (or single wall or vitreous enamel flue as it’s also known) is really what it sounds like it should be. It’s a single layer steel pipe that comes either coated with enamel or can also be constructed from stainless steel to protect the pipe. It contains no insulation or any other material inside it. One important point to be aware of it that as this is a single skin pipe, it can get very hot! What is Double Skin Flue Pipe? 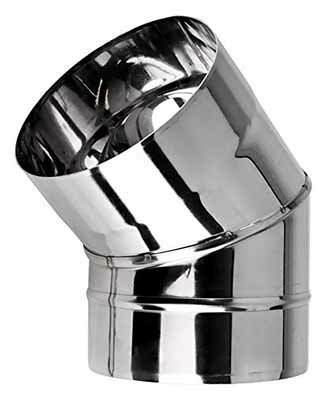 Double skin flue (or twin wall flue as it’s also known), again, is what it sounds like it should be. It’s essentially a pipe within a pipe and the gap between the two pipes is filled with a high grade, high temperature resistant insulation. In terms of the finish, most twin wall flue pipes are made from stainless steel but due to the presence of the insulation, the outer skin is kept much cooler, unlike a single skin flue, so it can be powder coated or painted using a specialist high temperature paint. 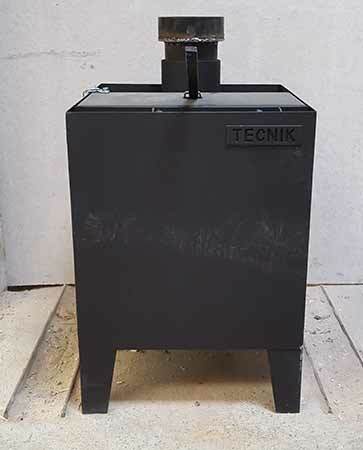 Overall, twin wall flues allow the burner and the flue itself to operate much more efficiently as the temperatures within the flue are kept more consistent. Ensuring the flue is kept at a constant temperature across the whole run also ensures that condensate buildup (e.g. soot, tar, creosote etc) is kept to a minimum. This will help to reduce the chances of any flue/chimney fires. If you already have your stove the manufacturer should state the size of flue that you should use to ensure your stove operates as efficiently as possible. If you don’t have this information then as a rule of thumb the regs state that you can use a 125mm flue only if you are burning smokeless, low volatile fuels or if your stove meets the requirements setout in the DEFRA Clean Air Act. Additionally your stove should also be under 20kW output. In the case that your stove’s output is up to 30kW or your are likely to be burning non-smokeless/volatile fuels (e.g. 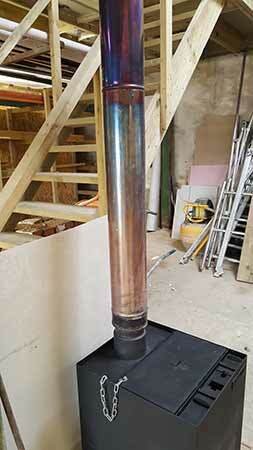 coal, untreated timber or compressed paper), the flue will need to be 150mm in size. For any stove outputting up to 50kW and burning non-smokeless volatile fules, the flue will need to be 175mm in diameter. In respect to the above, most burners only have a 125mm outlet so if you need to use a flue larger than this you will have to purchase an adaptor to join the two. One common question that we get here at DIY Doctor is; Can I fit my own wood burning or multifuel stove? In short, the answer is yes, you certainly can, but there are some caveats to be aware of. In terms of this, the major one being that installing a solid fuel stove such as a wood burner or multifuel stove is notifiable work and is governed by the Building Regulations (as is pretty much any flue or chimney related work). An interesting point to note here is that this particular type of work is only notifiable in England and Wales. If you are in Scotland building control notification is not required. Coming back to the Building Control aspect, before you start any installation work you will need to contact your local authority building control department and notify them of your plans. Once you have done so they should instruct you on what happens next e.g. when you can start, when you will need to contact them to arrange a visit to inspect the work you have done to ensure that it is safe and fit for purpose and also what fees are involved. If this is starting to sound like a bit too much hard work, you can employ a HETAS registered engineer to fit your stove and also deal with the Building Control side of things as HETAS engineers can self certify their own work. More information on this can be found on the HETAS website here. As with any appliance that burns solid fuel, carbon monoxide is a byproduct of the burning process. Carbon Monoxide is highly dangerous as it is very hard to detect unless you have a carbon monoxide detector installed. If your stove and flue are not installed correctly, this dangerous substance can easily build up and cause serious health isues and in some instances even death. With this in mind I’m sure you can now see why there are regulations governing how solid fuel stoves and burners are installed, so follow follow any and all rules and regulations as they are there to avoid disasters and save lives! For more information on the dangers of carbon monoxide and how to stay safe see our project here. How Much Clearance do you Need for Wood Burning and Multifuel Stoves? Aside from the overall Building Control aspect of things there are additional rules on where you can place your stove and how far it needs to be away from certain materials. What Clearance Should There be Around the Stove? One thing to be aware of with wood burning and multifuel stoves is that they will both require a certain amount of clear space around them. This is to allow the heat generated by the stove to dissipate safely out into the room. If the heat is not allowed to safely disperse into the room space, it can become trapped and buildup, causing the stove itself to overheat and also the objects surrounding it. In respect to this point you first have to consider what objects and materials surround your stove. If they are combustible e.g. timber etc then you will need to ensure there is at least a 400mm clearance on both sides and at the rear and a minimum of 450mm to the top, but this should also be stated by the manufacturer of your particular stove in the accompanying user manual. If not, contact the manufacturer to confirm. If, however your burner is surrounded by non-combustible materials such as solid walls then this distance can be reduced to around 150mm to the sides and rear and 350mm to the top, but again, confirm these distances with the manufacturer. In respect to the clearances for combustible materials, it is possible to reduce the required spacing from the recommended 400mm down to around 150mm by using heat shielding such as sheet steel, fibre board, cement board etc. It is also worthy to note that you will also need to provide an air gap between any heat shield and the surface behind to allow air flow. In most cases the air gap will need to be around 1 inch or 25mm. Any heat shielding will also have to be feature an air gap at it’s base e.g. mounted up off of the floor. Again, the exact recommendations for heat shielding for your particular stove should be stated in your stoves user manual, if not, contact the manufacturer to find out the exact specifications but most manufacturers state using 28 gauge sheet steel or the equivalent. What Clearance Should There be Around the Flue? As with the above, any required clearances around flue stacks/chimneys will be dictated by the objects and materials around it e.g. whether they are combustible or not. If using a single skin flue pipe that is in close proximity to any combustible materials then the flue will need to be a minimum 3 times the diameter of the flue away from the object/materials in question. For example, if the flue is 150mm in diameter then it will need to be a minimum of 450mm away from any combustible material surrounding it. Additionally, a single skin flue also needs to be a minimum of 150mm from a ceiling, roof or floor if any such surface is also combustible. As an example to this you could use a single skin flue to come off of the top of your stove and then join to a twin wall flue (with suitable spacing) to run through the ceiling/roof. Also when doing so, the point where the 2 join needs to be in the same room as the stove itself. As for stoves above, combustible materials close to a single skin flue can also be heat shielded using a suitable material which will then allow you to place them much closer. The exact heat shielding materials to use and the correct distance the flue can reside in relation to the combustible material should be stated by the manufacturer but if not, contact them to find out. 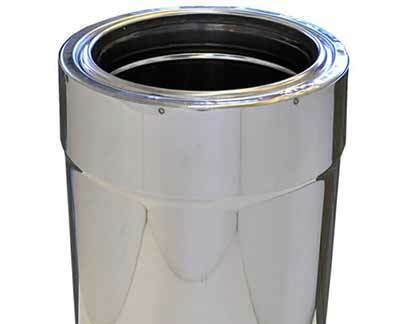 Twin or double skin flues are, on the whole, a little easier to deal with as they are already technically shielded. 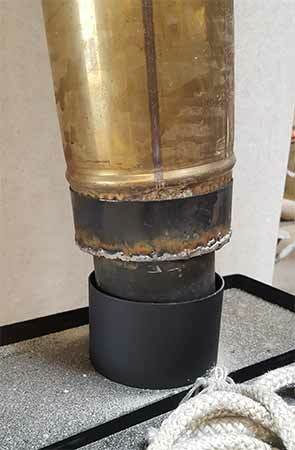 In light of this, a twin wall flue can normally be placed somewhere between 5cm and 8cm (50 – 80mm) from a combustible material, but this will depend on the manufacturer or model of the flue (again, check with the manufacturer or building control officer for exact safe distances). As we have stated above, the best most efficient route for your flue is vertically straight up, but in some cases this may not be possible and you may have to exit through an external wall. If this is the case then you will need to use either flue bends or T-pieces to route the flue to a location it can exit the building. So, with the above in mind, do not exceed 4 bends in total throughout your entire flue run and avoid using a 90° T-piece if you can as this will restrict how many bends you can use in total. How High Does a Flue Need to be? As a rule of thumb, a flue or chimney should be no less than 4.5m above the top of the stove, but there can be exceptions to this. 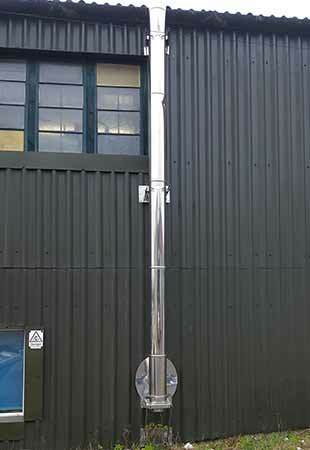 Modern twin wall/double skin flues are highly efficient and can in some cases be 3-3.5m above the stove. Essentially, as long as the stove has the required amount of “draw” and operates correctly, lower stack heights are possible, but you will need to check with building control. 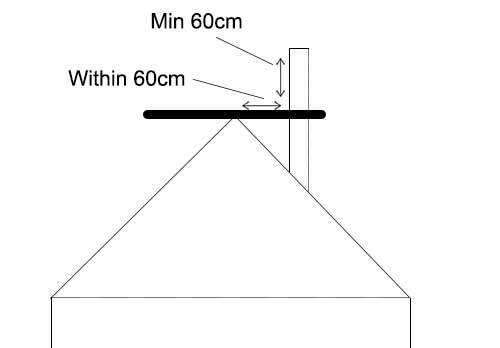 Additionally, if your flue is closer then 60cm to the ridge of your building then it will need to be at least 60cm above the ridge. Finally, your flue should not be restricted by any object within 2.3m. 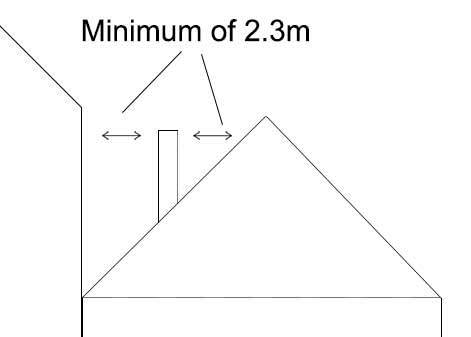 For example, any neighbouring properties/structures should be no less than 2.3m away and this also applies to the ridge/roof slope. Do I Need to Install a Hearth? In answer to this, it depends if the floor surface you’re installing your stove on is combustible. If it is e.g. a timber floor then the answer is yes, you do need to install a solid, non-combustible hearth as this will protect the floor from the heat of the stove. If the heat from the stove reaching the floor surface will be no greater than 100°C then it’s height or thickness can be 12mm. This is the case for both combustible and non-combustible floor surfaces. If the heat from the stove reaching a combustible floor is likely to well exceed 100°C then the hearth will need to be at least 250mm in height or thickness. 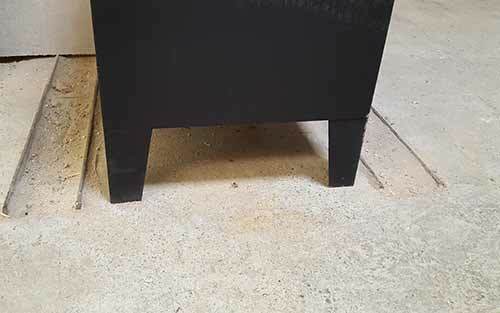 This can be reduced to around 125mm if you are able to introduce a minimum of a 50mm air gap between the base of the hearth and the surface of the floor. In the case that your floor is non-combustible e.g. solid concrete or similar then it will still need to be at least 250mm thick including any additional hearth that is installed. Again, the height or thickness can be reduced by introducing a minimum 50mm air gap. Now that we have established how thick or deep our hearth needs to be we now need to look its length and width. As before the Building Regulations come into play. The regs state that where a stove does not heat the hearth area below to more than 100°C, it will need to extend at least 150mm beyond the stove on each side (including the rear) and a minimum of 300mm at the front. In the case that the stove is likely to heat the surface below to over 100°C then the hearth needs to extend a minimum of 500mm to the front from the face (or jamb) of the alcove or recess. 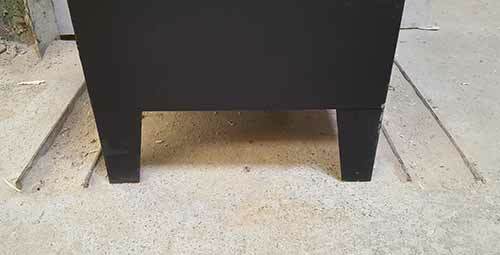 If it’s a free standing stove the hearth will need to be a minimum of 840mm long by 840mm wide but it will also need to extend at least 300mm out from the front of the stove. In both cases it’s a good idea to extend in front and around your stove as much as you can as this not only gives protection to the floor area but also defines a safety zone, preventing anyone form bumping into it causing injury. The regulations state The boundary of the hearth should be “visually apparent” e.g. a raised step or change in level so that it can be easily seen by any users of the building plus prevent anyone from running combustible materials such as wood flooring or carpets too close to the stove or appliance. Now that we have established the size requirements for our constructional hearth we now need to look at what materials can be used to construct them. Again the regs are our first port of call. 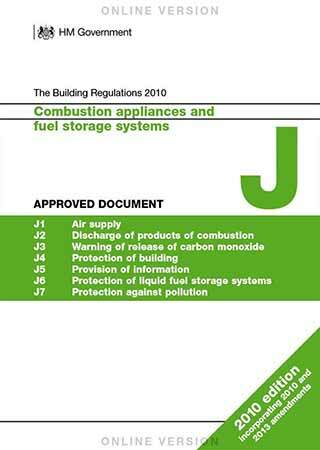 Building Regulations Document J states that a constructional hearth should be made of solid, non-combustible materials such as concrete or masonry. With this in mind, you can construct a hearth using solid concrete by creating shuttering of the correct dimensions e.g. 840mm x 840mm and 250mm thick, allow it to cure and then remove the shutters to leave a solid concrete hearth. You can also construct a hearth using bricks but just make sure you use the correct mortar mix. A standard mortar mix will not fair well when exposed to heat and will crack. Traditionally a 3 to 1 sand and lime mix should be used to construct chimneys and brickwork in close proximity to heat as this will allow for expansion and contraction. If you have a few quid to spare and want to go for something really fancy then you could use a solid piece of slate. This will look amazing and give a real focal point to your woordburner but it won’t be cheap!! If you are in any doubt about what you can use to construct your hearth, check with your local building control officer. If you have a particularly long run of flue then it will need to be supported, not only to prevent it toppling over but also to prevent the weight of the flue bearing down on top of the stove as the flue itself should not be sat on the stove. In most cases, if you have a long vertical section of flue it will need to be supported to prevent it bending or falling over. 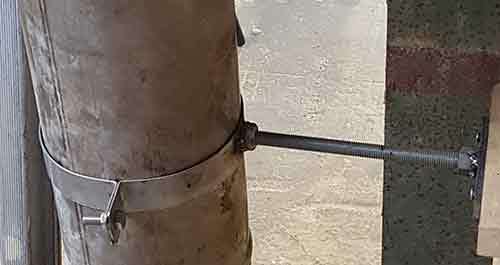 Normally this can be achieved by fitting a bracket around the flue pipe and then securing it to a solid surface nearby. 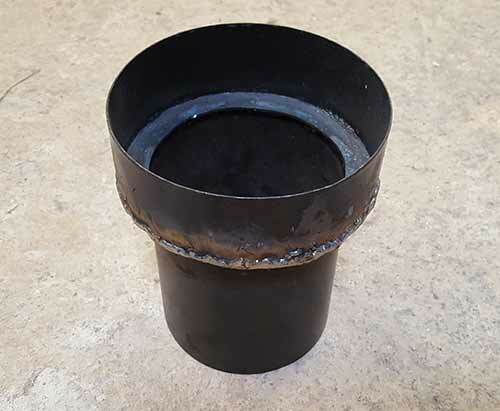 The manufacturer of your chosen flue pipe should be able to advise on and supply the correct brackets but if you have the necessary skills you can make your own. From a young age we are all taught of the dangers of fire and how they can easily get out of hand if certain precautions are not taken into account. With this in mind it is essential that any combustible materials or fuels are stored safely away from your stove to prevent any stray embers from dropping onto them and igniting. Apart from the fuels themselves you should also ensure that any flammable dust and debris is cleaned up. Small timber offcuts, sawdust and shavings can easily collect and buildup over time and cause a major fire risk. 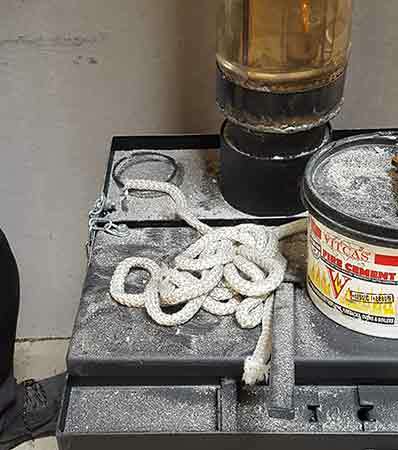 To prevent this from happening it is essential that you keep not only the area directly around your stove clean but also your workshop as a whole. If you do cut a lot of timber and create a lot of sawdust make sure any machinery is fitted with the correct dust extraction so that it is all sucked up and contained. Ensuring that you have enough ventilation and fresh air is also a very important consideration as firstly, your stove needs a constant supply of air for combustion and secondly to ensure the flue can create enough draw to effectively remove any smoke and fumes. As we are dealing with installing a stove in a workshop, chances are there is going to be enough natural ventilation due to poorly fitting doors and windows and other gaps to supply any required air, but if your workshop is particularly new and sealed up you may have to look at providing some fixed vents. In respect to this, Building Regulations Document J states that you should supply 550mm2 of ventilation for every kW your chosen stove outputs over 5kW. So, for example if you have a 10kW stove you will need to supply 2750mm2 of ventilation (5 x 550mm2 = 2750mm2). The first job is to get your stove or wood burner into it’s final resting place. If you need to construct a hearth make sure this is done well in advance of fitting so that it has time to cure correctly if needed. Once in place, make sure that it is flat and level and also stable! If it rocks from side to side this is no good and you will need to adjust the level of your hearth or floor to prevent this. In the case of this stove, the concrete base below it was totally solid and over 300mm thick with no combustible surface below it so provided a more than adequate base. The final check is to measure all the distances around the stove to ensure it is situated far enough away from any combustible items. More info on required spacing’s below. For this stove there were some timber stairs and a timber cross beam just over 18 inches away and although the fitter in question confirmed distances should be safe the belt and braces approach was taken and heat shielding was to be installed anyway. With the stove located the flue adaptor was then inserted into the flue outlet on the stove. As the adaptor was custom made it was 20mm smaller than the outlet collar on the stove. This was to allow it to be sealed correctly to prevent any smoke or fumes escaping. 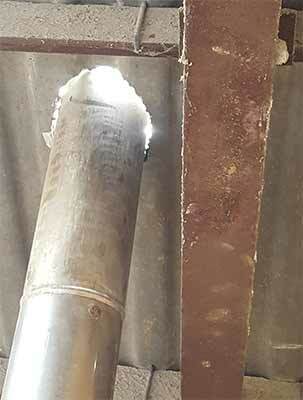 More below on how the flue was correctly sealed. As the flue was to be run vertically upwards and straight through the roof, a plumbob was first dangled down from a point on the roof and moved until it was directly over the centre of the stove outlet. A second pair of hands was needed at this point to ensure positioning was accurate. This enabled the fitters to pin point exactly the position on the roof that needed to be cut out in order to run the flue out. With the centre point of the hole marked a circle was then drawn on the roof roughly 40mm larger than the diameter of the flue. This was to allow a little wiggle room for the flue so that it could be leveled totally vertically. With the hole now cut in the roof, further sections of flue were added to the stack and it was poked through the hole in the roof. The flue was then centred in the adaptor on top the stove ready for sealing up. Just before sealing up, the flue was leveled up using a spirit level to ensure it was totally vertically upright. To seal it up you can use either fireproof cement or fireproof rope. In this case both were used. 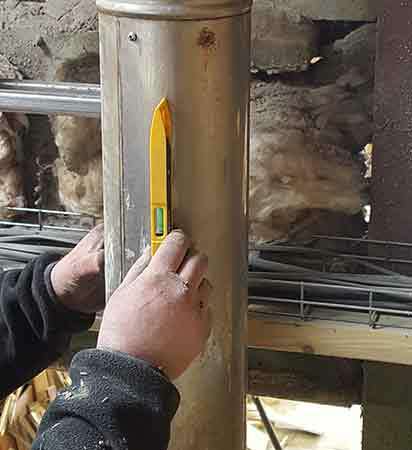 The rope was pushed down into the adaptor collar and around the flue in layers, compacting down each coil as it was laid until it was around 20mm from the top where it was snipped off. The remaining 20mm was then filled with fireproof cement to ensure it was fully sealed up tight. It is possible to just use the fireproof cement for this job but even though it is fire resistant, it will crack up over time. How the hole in the roof is sealed up will be very much dictated by what type of roof covering you have. In most cases it will either be tiles of some kind, roofing sheets or a flat roof. In this case the roof had been constructed using large modern cement fibre sheets (the modern non-asbestos type, they were tested first using the asbestos test kit mentioned above). Due to the size of the sheets it was decided that a lead tile would be used that would be bonded over the top of the hole using roofing sealant. If however you have tiles or a EPDM rubber covered flat roof then you may want to opt for something purpose built for the job. Your flue manufacturer or supplier should be able to offer advice on what best to use and they may even be able to supply the correct covering. What ever you use, just make sure it’s lapped into the other tiles or sealed down fully to prevent any leaks. With the hole sealed over, the final section of flue was added to the top to ensure that it was high enough to prevent any wind turbulence from effecting its performance and also to take it beyond the 2.3m requirement in terms of distance from the roof line. A cowl was also added to the final section of flue to prevent water, birds and other objects from falling down the flue. To prevent water ingress down through the gap between the flue and the upright of the lead tile, a rubber gasket was added. The gasket itself was a very tight fit over the flue to ensure it sealed as well as possible. For added protection a storm guard was then placed over the top of the gasket that was then sealed using heat proof silicone rated to withstand temperatures up to 1300°C. The entire stack was then clipped together using the supplied clips to secure it all. The final job was to ensure the flue remained upright by adding a bracket that was in turn secured to a nearby steel beam. Holes were marked and drilled in the beam and the bracket was fixed in place around the flue. The final job was now to light the stove up and test it out! Installing a multifuel stove in a workshop is a fairly straight forward job and if you are thinking of installing your own, just make sure you have read and understood all of the relevant building regulations and have also contacted your local building control officer to notify them of your intended plans.